All seats function on the telescopic principle and when closed, provide either a flat fold front or closed back. The operation of the seating is progressive and upon closing, all rows move to the closed position providing an increase of usable floor space. The system incorporates a locking mechanism provided by individual row locks or cylinder locks. These permit securement of any row in user position, and it operates only upon the unlocking and moving of the first row. 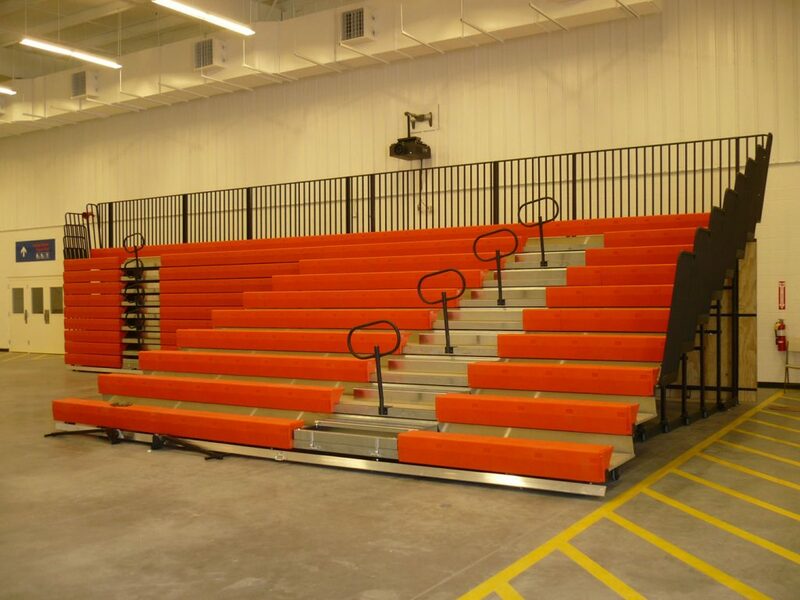 All bleacher components are fabricated in our plant where they are stringently tested and inspected to ensure a safe, top quality seating system. Sheridan’s high density polyethylene modular seating are richly textured and available in 12 standard colors. The sculpt-formed seat is anatomically contoured with no planar surface to give a genuinely comfortable bleacher seat. The surface of the seat is a scuff resistant texture and the color is molded in so that it cannot wear off.